FAQ stands for Frequently Asked Questions. This page contains a list of FAQ’s relating to the Chagrin Valley Nation Native Sons and Daughters program. If you have a question not answered here, please contact the Chagrin Valley Nation Longhouse Chief. What is this Native Sons and Daughters program about? In 2010, The Chagrin Valley Nation joined the National Longhouse Native Sons and Daughters. Affiliating with the Native Sons and Daughters programs has allowed us to provide enhanced programming, a user friendly registration process and has assisted our recruitment effort. If you have any questions regarding this change, please contact the Native Sons Chief or the Native Daughters Chief. What is the difference between the Native Sons and Native Daughters programs? The Native Sons program is for father/sons, the Native Daughters program is for fathers/daughters. Both programs operate very similarly. Events are scheduled on different weekends regularly durring the 9 month school year for the convenience of fathers that have children in both the Native Sons, the Native Daughters programs. Some events are “family” events where both sons, daughters and the extended family are invited. I have a son who wants to join the Native Sons and a daughter who wants to join the Native Daughters, do I have to register (and pay) twice? No, the registration process is done one time to enroll your entire family in the program – all sons and all daughters. Registration information can be found on the Home page. I’m a busy person, but I want to spend more time with my child. The Chagrin Valley Nation Native Sons and Daughters programs are perfect for you! There are no mandatory meetings, no fund raising – just monthly events for you and your child to enjoy together and an occasional tribal meeting depending on your tribe. Event attendance is not mandatory – come to as many events as you like. What’s this Longhouse meeting I hear about? Each tribe has one father who volunteers to be the Longhouse representative for his tribe. Once a month, all of the Longhouse representatives meet to plan our events. If a Longhouse rep cannot attend a meeting, another member of his tribe should go in his place. Check with your Tribal Chief to find out where and when the next meeting is. Contact the Chagrin Valley Nation Longhouse Chief if you are interested in running a tribe or attending a meeting. How old are the children in the Native Sons & Daughter programs? Children in the Native Sons and Daughters programs can join when they enter Kindergarten. The program ends 6th grade. How are the Chagrin Valley Nation Native Sons and Daughters programs organized? Each program, Sons and Daughters run their own event schedules. Each program is comprised of several smaller groups (tribes). Most monthly events are Nation Events – events for all tribes – consequently, if your son or daughter has friends in other tribes, they will be sure to see them at the events. Other Monthly Events are for individual tribes only. Check Calendar on the right side of each page to see which type of event is for that month. What tribe should I join? Please see the Home page for more information on selecting a tribe. Most families join at the beginning of the school year but you are welcome to join at any time. What kind of rituals and ceremonies are performed as part of the Native Sons and Daughters program? The Sons and Daughters all love participating in the Chagrin Valley Nation’s torch parade, held at our Fall and Spring campouts, which leads to our bonfire ‘ceremony’ , which always includes a meaningful story with a great moral for the children. Do I have to be Christian to join Native Sons and Daughters? Absolutely not. 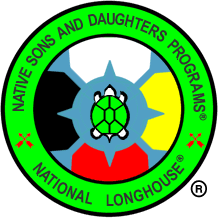 Even though the National Longhouse is a Christian based organization, the Native Sons and Daughters program is non-denominational as are all of our events. The demographics of the Chagrin Valley Nation speak favorably to this fact. Please visit Circle Bridge to login (returning users) or register (new users). Daughters Fall Campout -- Fitch!!! Copyright 2014 The Chagrin Valley Nation Native Sons and Daughters. Contact the CVN website administrator with any website comments.